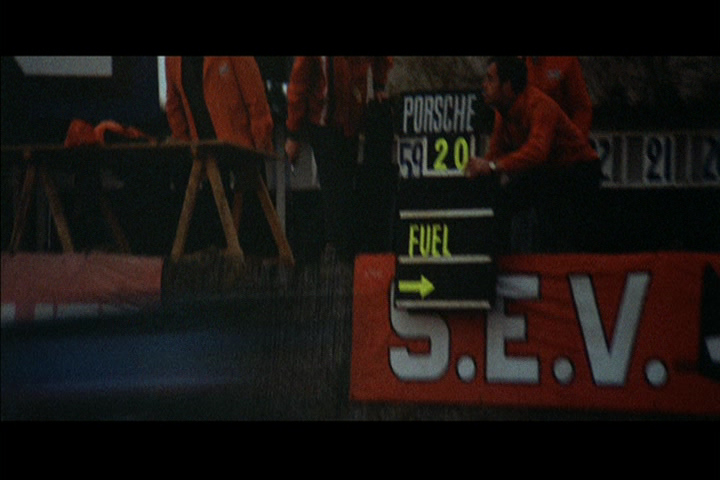 Want a jacket just like Steve McQueen wore in the move? Go here. 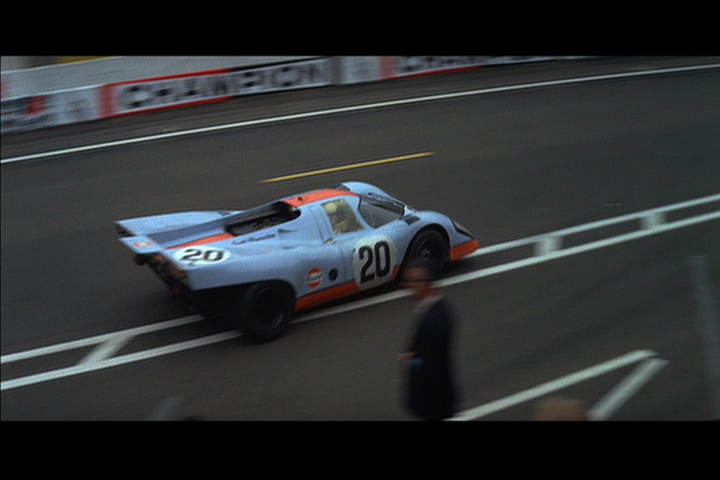 Filmed in 1970 and released in 1971, the movie Le Mans was not met with favorable reviews by movie critics but it remains one of the classic motor racing movies ever made. 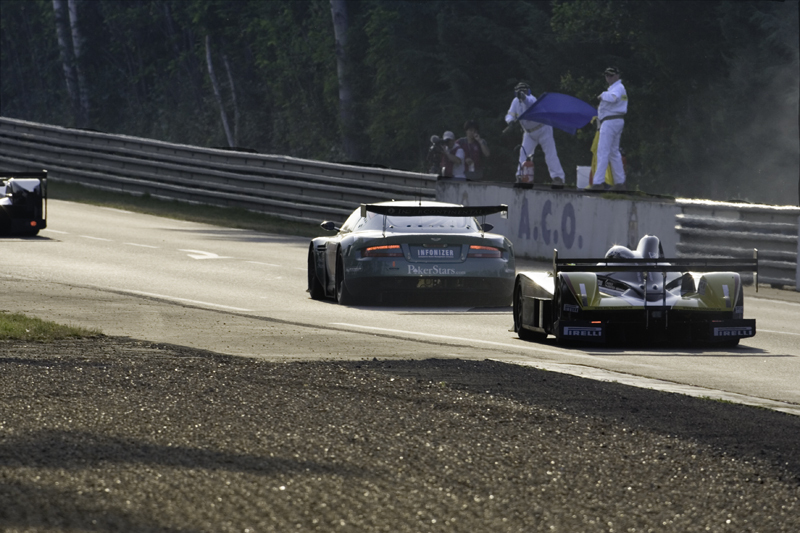 Although almost completely devoid of a discernible plot by traditional standards, the film is none-the-less entertaining for sports car enthusiasts because of the incredibly realistic racing scenes and total on-location filming. 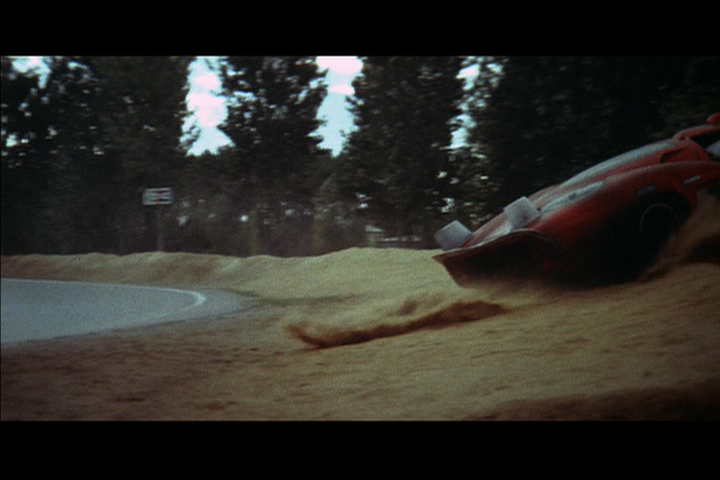 In fact, racing fans actually point to the lack of a plot as a plus, since nothing interferes with the racing, which is after all how McQueen wanted the film to be in the first place. 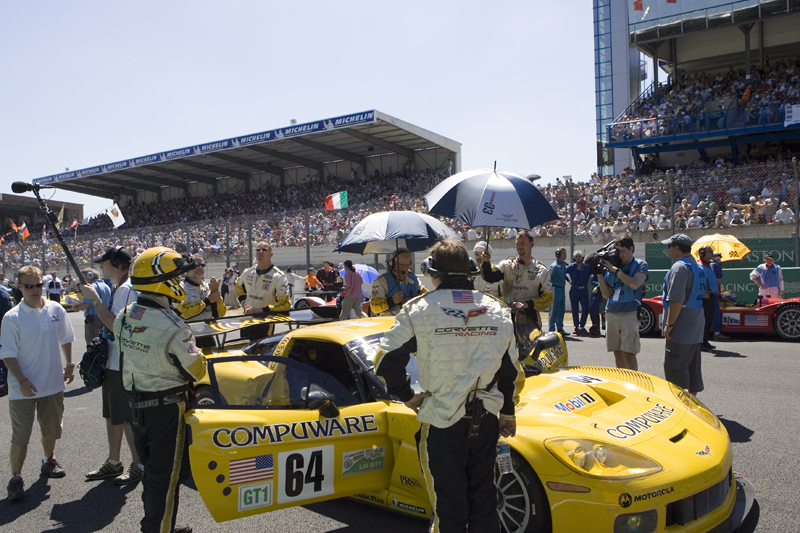 What little plot there is centers around the central character played by McQueen, Michael Delaney, an American race car driver who is returning to drive at Le Mans after surviving a serious accident the previous year. 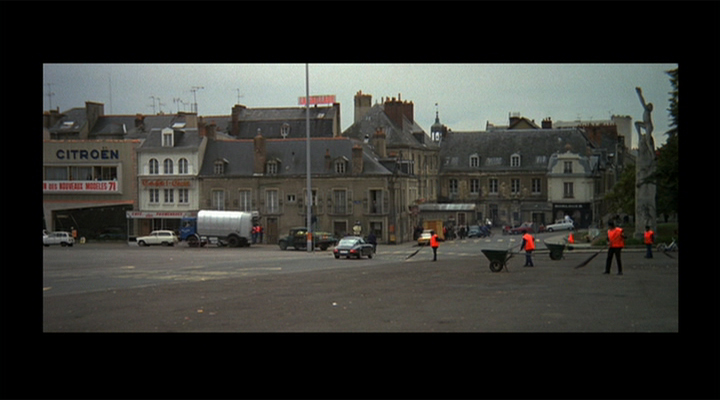 The first 36 minutes of the film are without any dialogue from any of the actors. 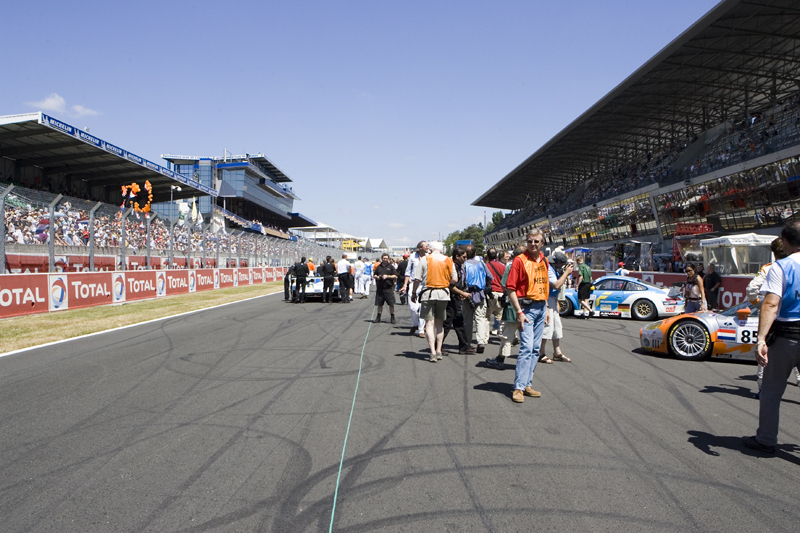 The voice of Lee J. Cobb can be heard in the role of the track announcer, and his commentary serves to explain some of the more arcane aspects of the sport to members of the audience who may not be sports car or racing fans. But even after the main protagonists begin to speak, the dialogue is brief and rather uncomplicated. 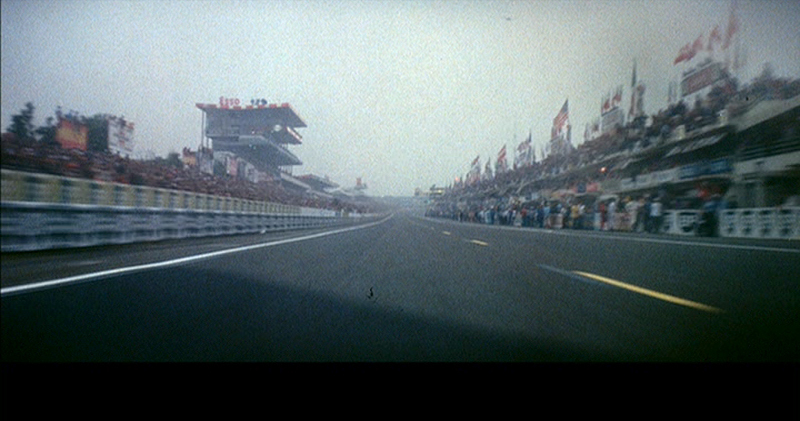 The race cars and the race dominate the film. 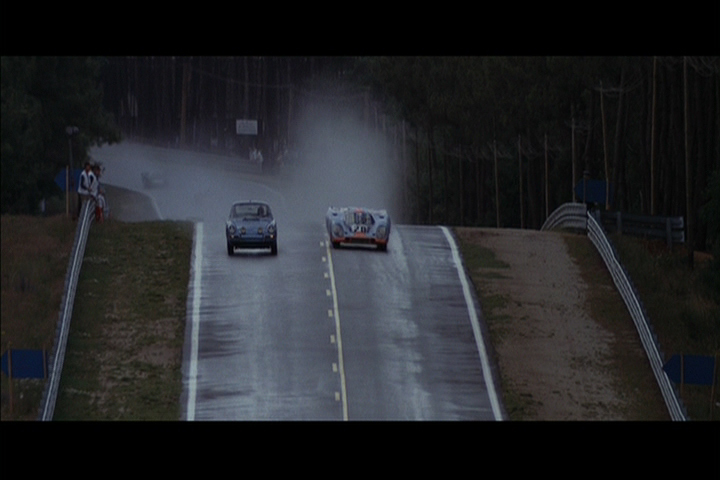 As McQueen intended. 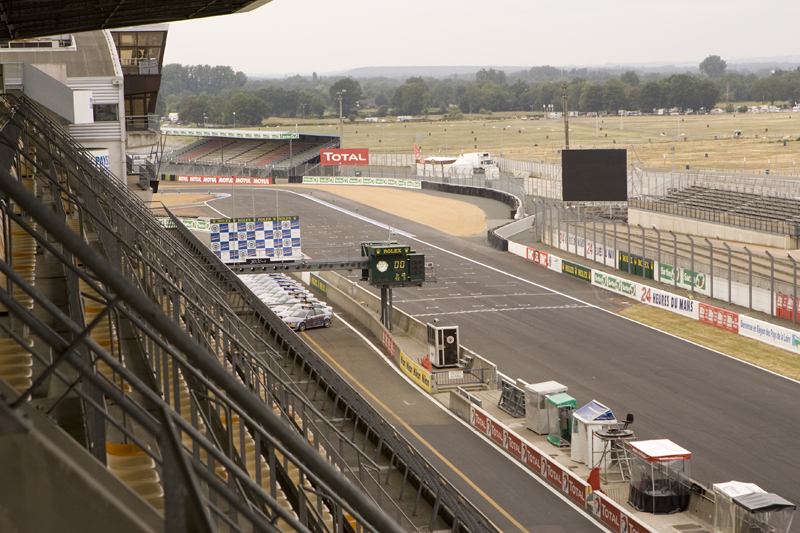 To learn a tremendous amount about the making of the movie, the circuit, the 24 Hours of Le Mans, the cars, and the drivers, purchase the book "A French Kiss with Death". 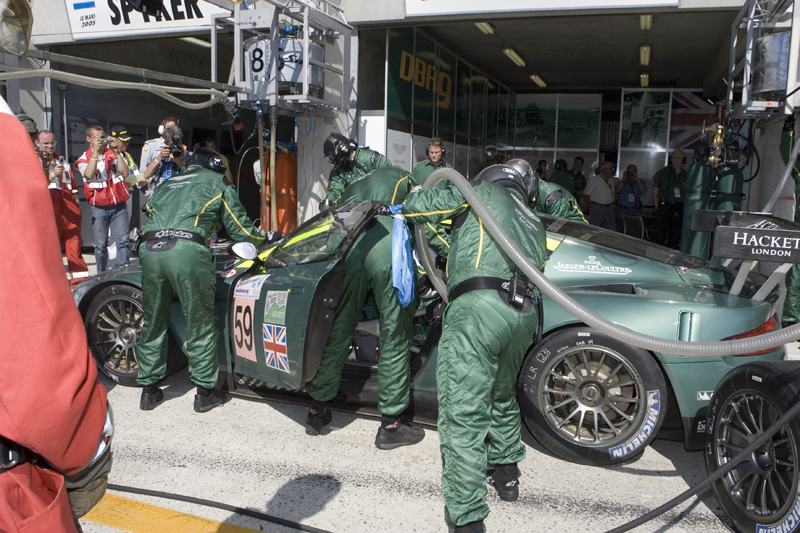 Not only is it filled with detail about the making of the movie, but it is crammed with mostly never before seen photos of McQueen and the actual locations used for the film. 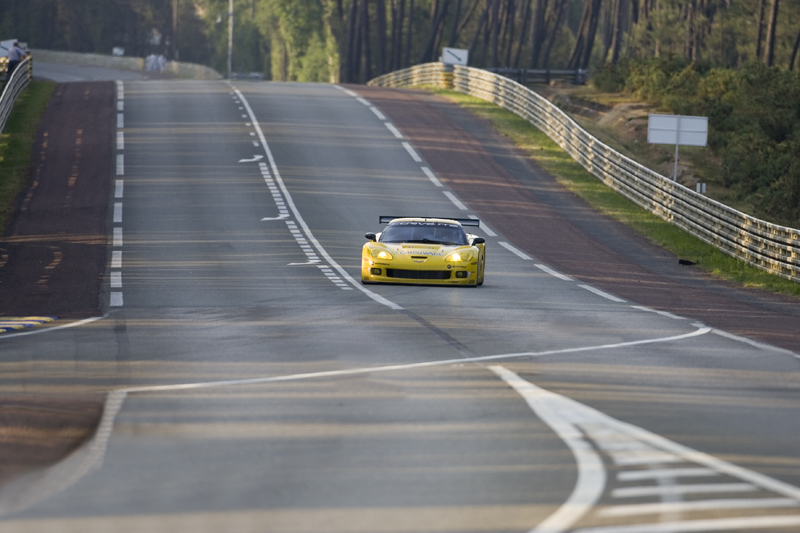 If you don't already own the Le Mans DVD, buy it. It supports Dolby Surround Sound and the cinematography is outstanding. 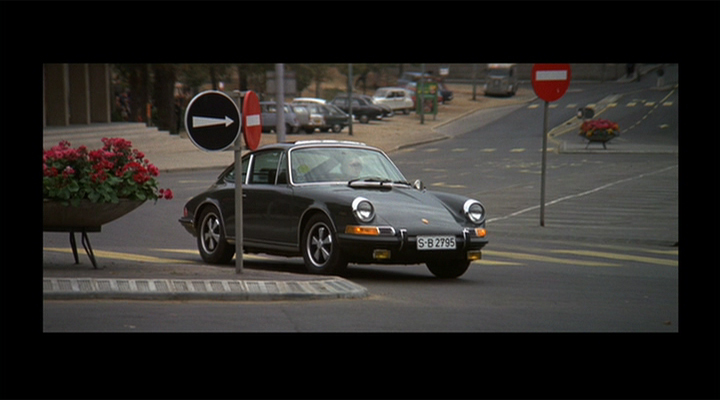 It's a must-have for Steve McQueen fans, as well as sports car racing fans. 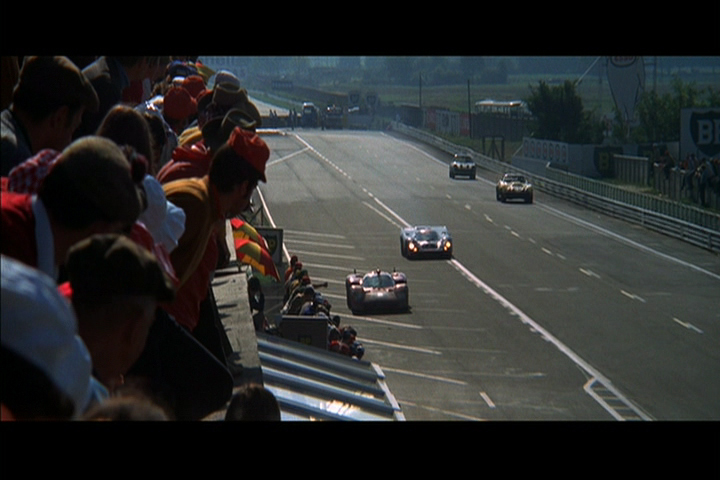 Still captures from the Le Mans DVD are copyright © Cinema Center Films, are used with permission, and are included here for review puposes only. Cathedrale St Julien 2006 Cathedrale St Julien 2006. 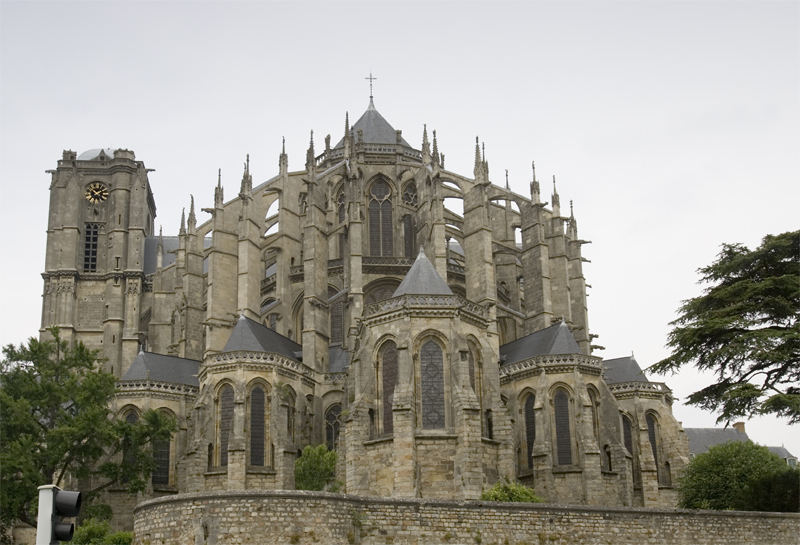 Cathedrales don't change much. Flower Stand 2006 The flower stand is a cafe as it was in 1970. Intersection where Delaney Sees Signora Belgetti 1970 He looks across to flower stand from here. 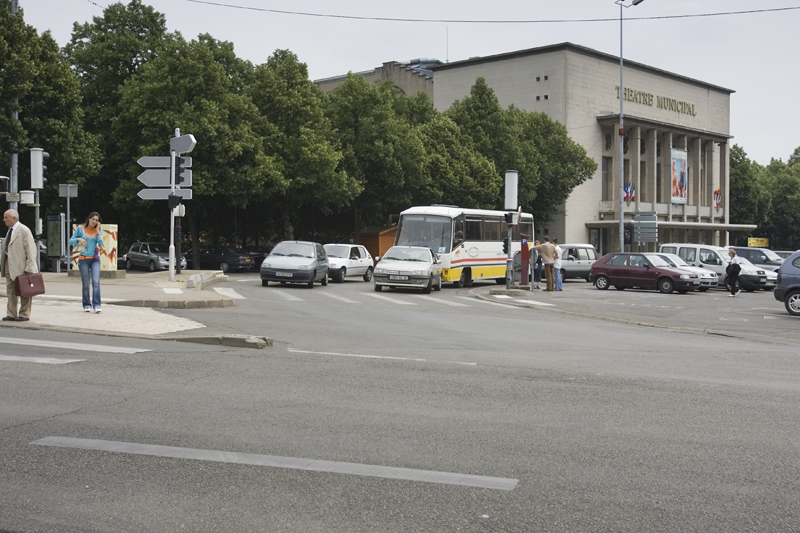 Intersection where Delaney Sees Signora Belgetti 2006 He looks across to flower stand from here. Paddock 1970 Paddock 1970: Very primitive by today's standards. Paddock 2005 Paddock 2005: The facilities are better, but still leave a lot to be desired. 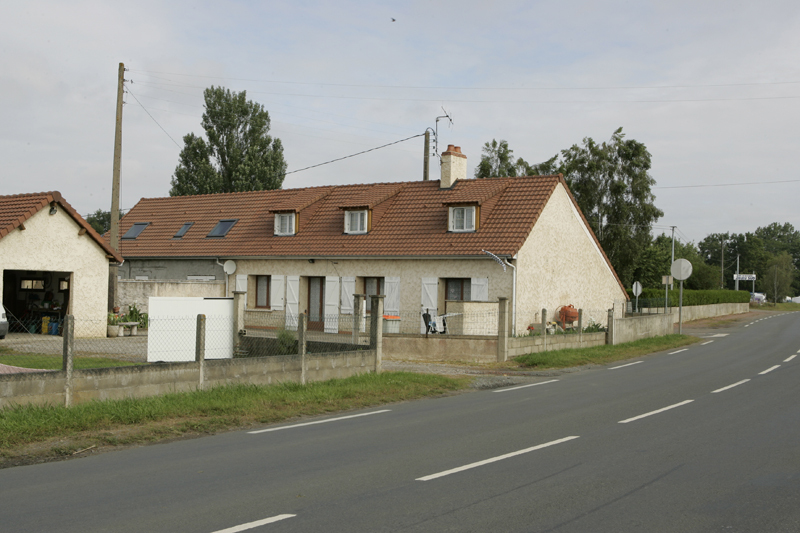 Renovations are planned for 2007. Awaiting The Start 1970 Mechanics stand around anxiously awaiting the start of the race with Gendarmes present to keep order. 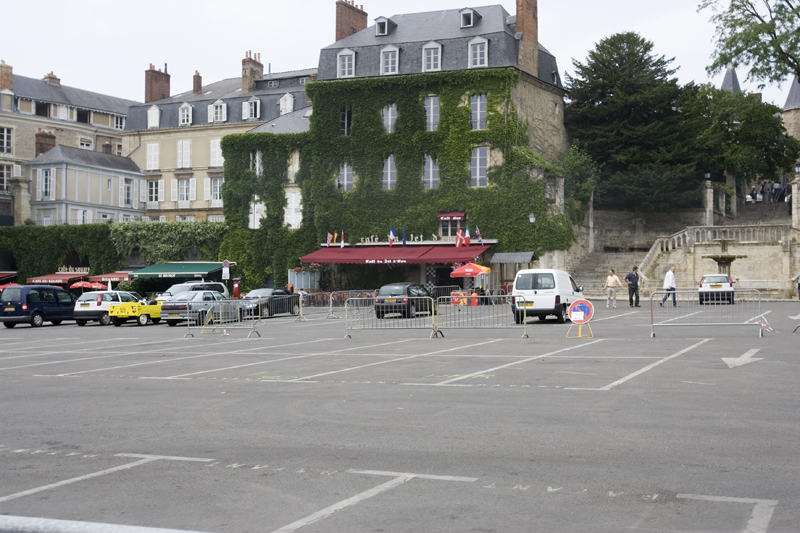 Awaiting The Start 2005 Gendarmes no longer maintain security, but mechanics still wait anxiously for the start while media people swarm. 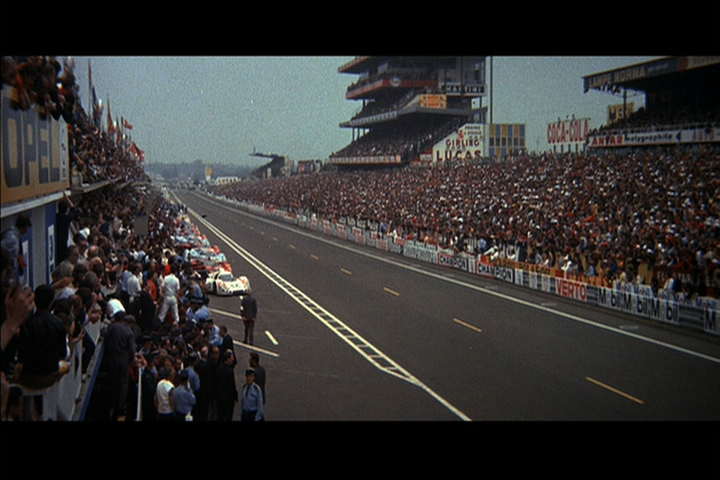 Awaiting The Start 1970 The grandstands are packed and the fans await the 4PM start of the race. Team members enjoy the spectacle. Awaiting The Start 2005 Umbrellas keep the hot sun off the Nomex enshrouded drivers and everyone just waits for 4PM. 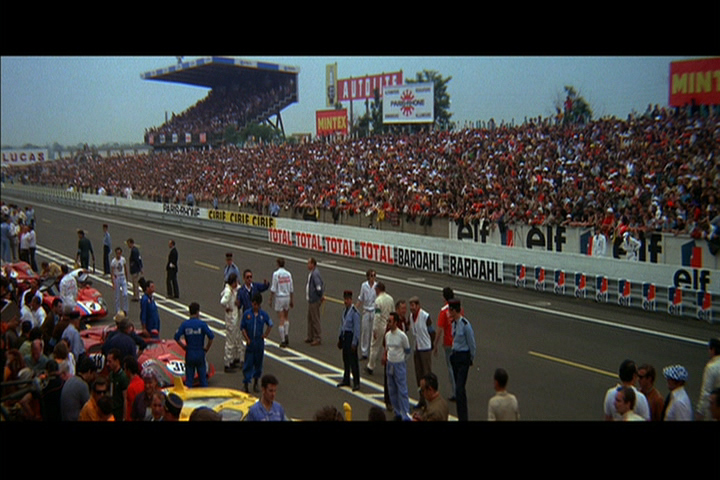 Race Start 1970 Standing Start 1970. 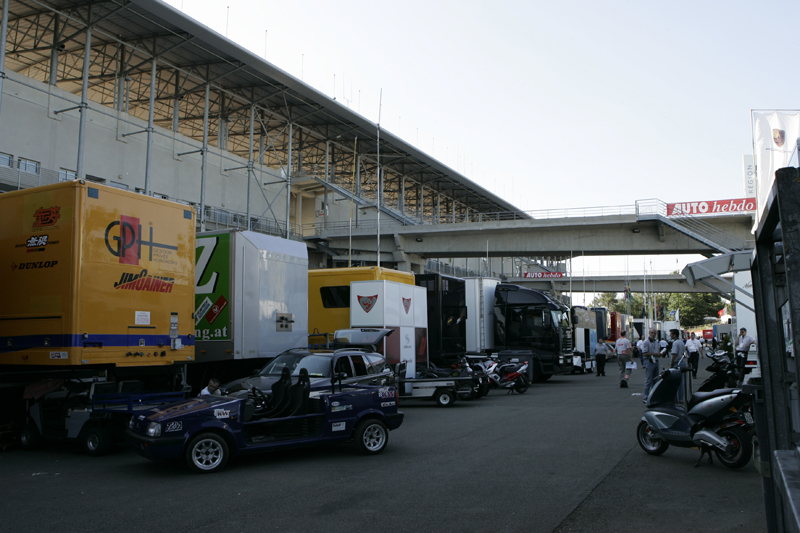 This was the first year the drivers didn't sprint to their cars. 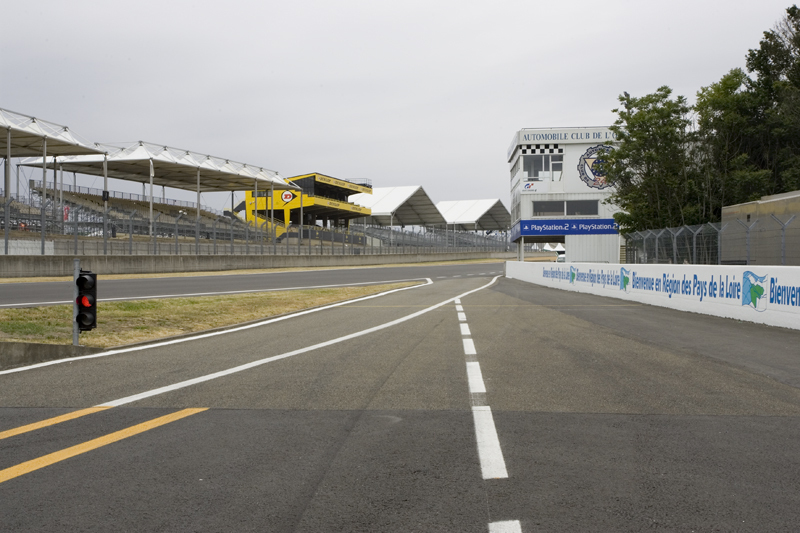 Standing start was still dangerous. 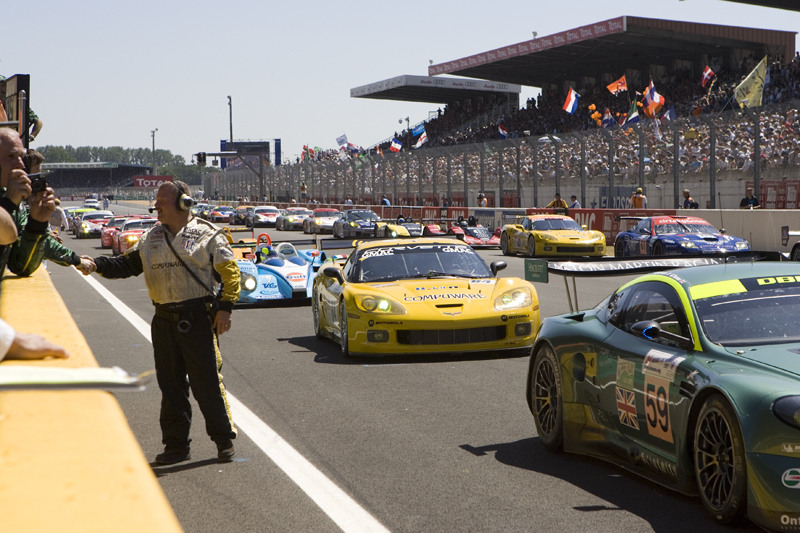 Race Start 2005 Cars are lined up for recon lap prior to rolling start. No more standing starts. 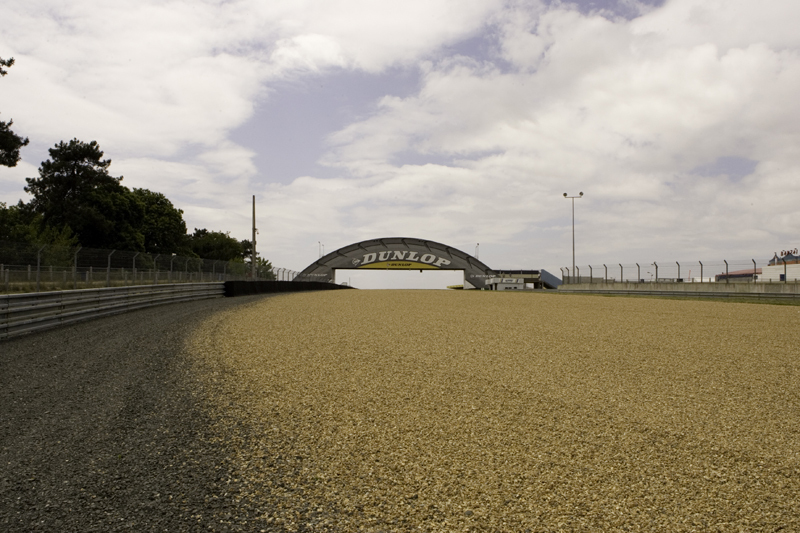 Dunlop Bridge 1970 This was before they built the grandstand. 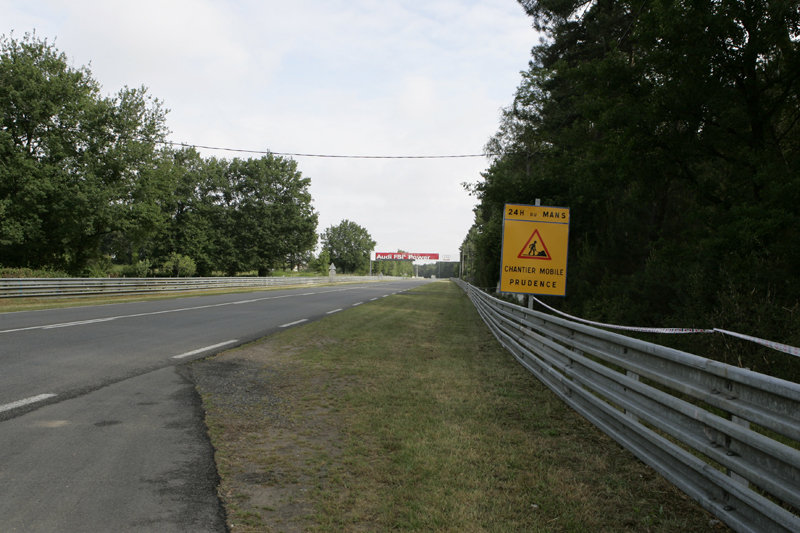 Dunlop Bridge 2005 The new grandstand is visible but not the new chicane installed to once again slow the cars. 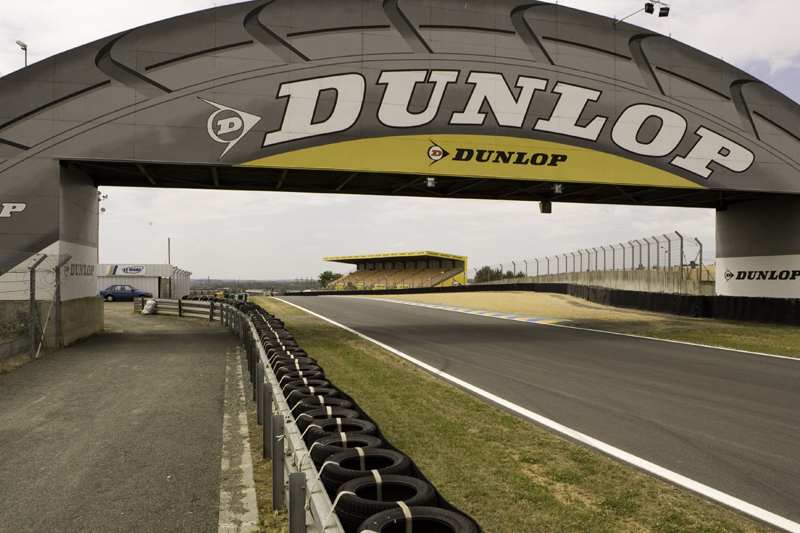 Dunlop Bridge 1970 It was a straight run down to Descent de la Chappelle in 1970 with spetators close by on both sides of the track. 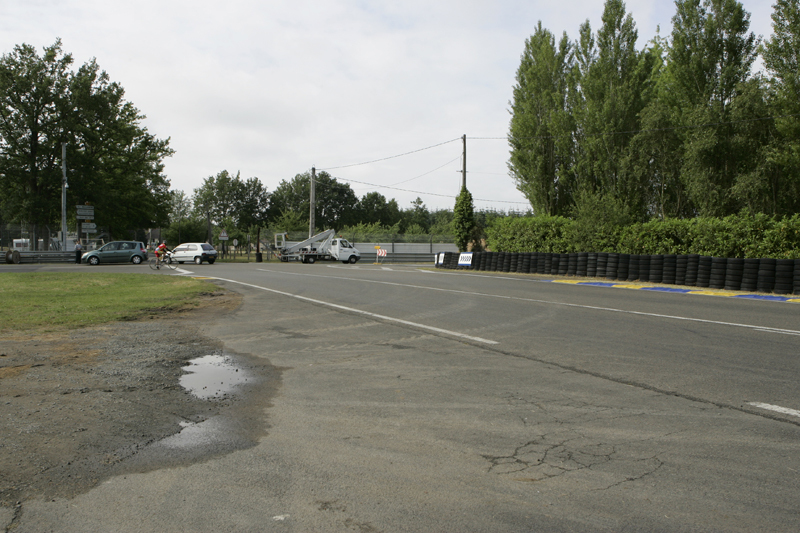 Dunlop Bridge 2005 Spectator areas have disappeared as gravel run-off areas have been installed along with debris fences. Descent de la Chapelle 2005 The Descent to the Church is now mostly gravel run-off and sterile. 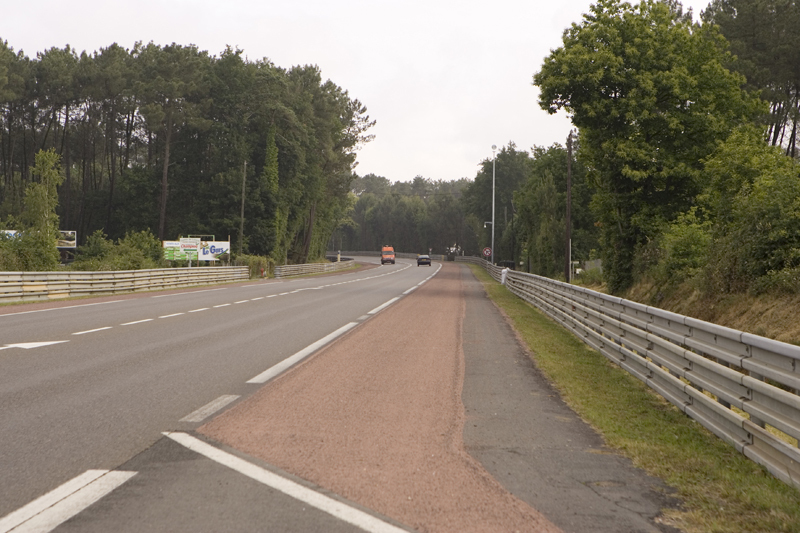 Tertre Rouge Entry 1970 Literally "Red Mound", it was a scenic viewing area in 1970. The Dunlop pedestrian bridge is no longer there. 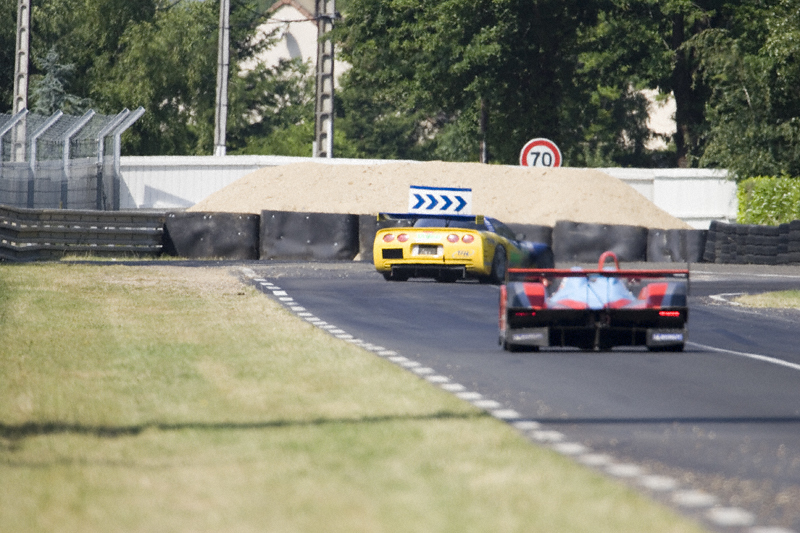 Tertre Rouge Entry 2005 Safety regulations and gravel run-offs have destroyed the ambience. 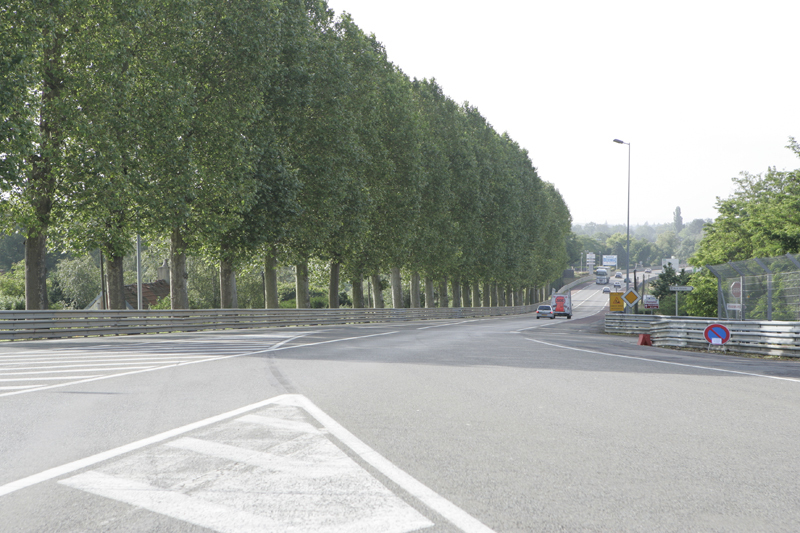 Tertre Rouge Exit 1970 Note the white paint on the trunks of the poplar trees to help the drivers at night. 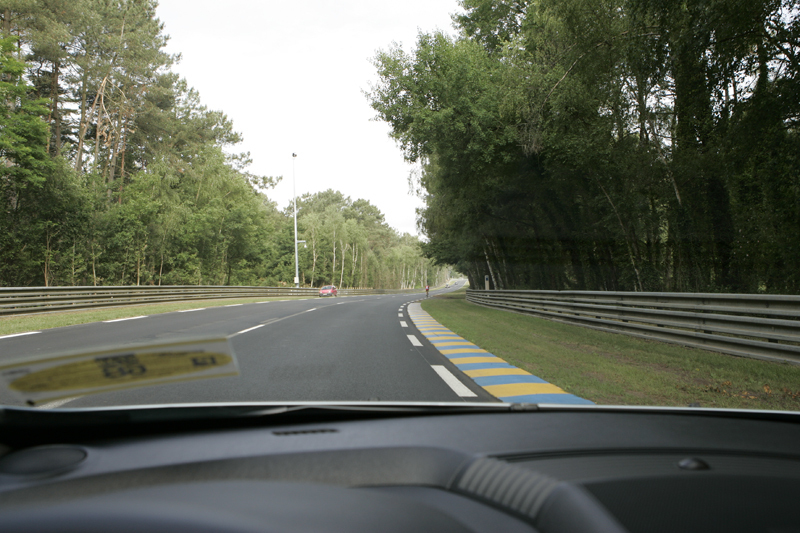 Tertre Rouge Exit 2005 The 100 year old poplar trees are a signature of this corner. 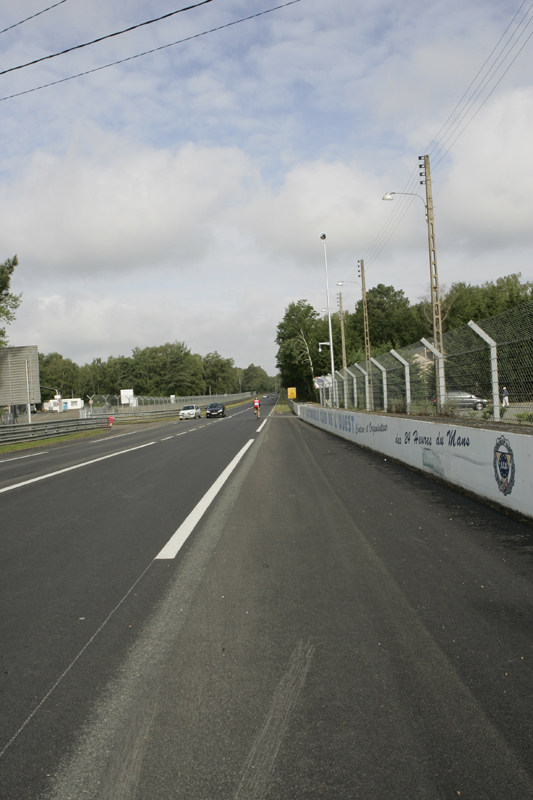 Mulsanne Straight 1970 Known locally as "Ligne Droit des Hunaudieres"
Mulsanne Straight 2005 To slow the cars, which where reaching 240 mph, two chicanes were installed in the straight in 1990. 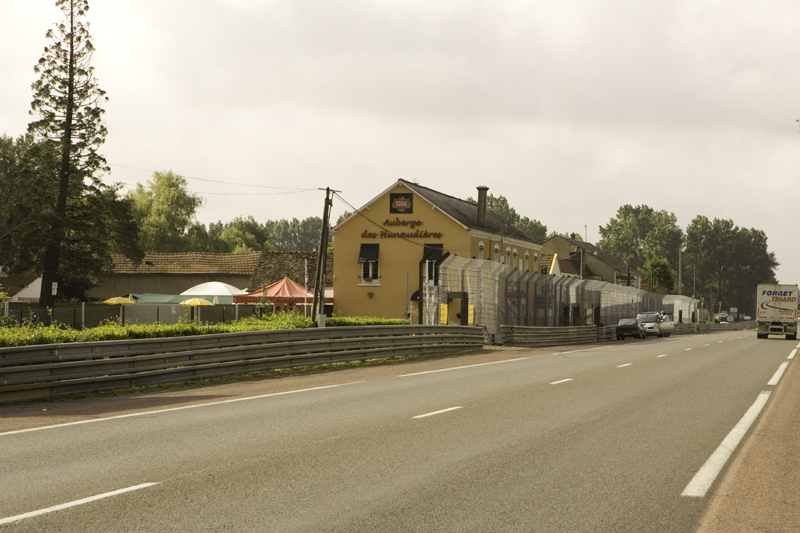 Hotel des Hunaudieres Open 24 Heures, even during the race. 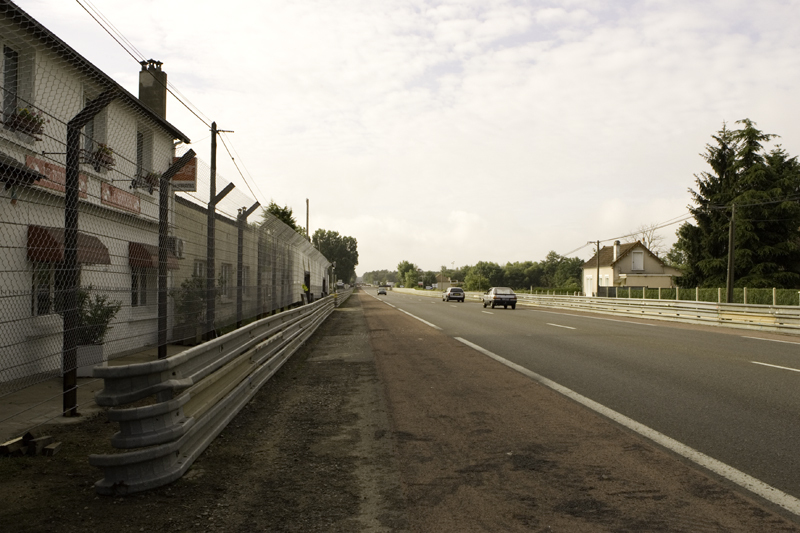 Hotel des Hunaudieres 2005 In 1970 you could sit here, eat a meal, and watch the cars whiz by at over 200 mph with no armco or debris fencing. 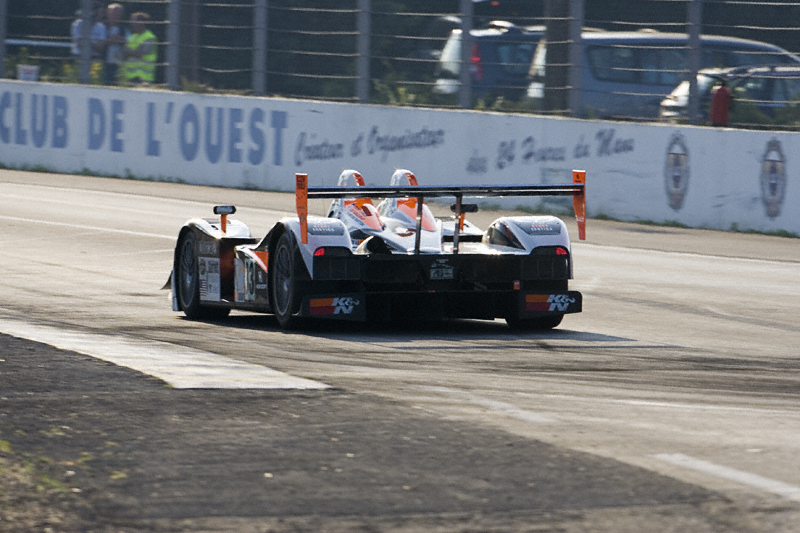 Kink 2005 Not quite as severe as in 1970, but at over 180mph I'm sure it gets a driver's attention none-the-less. 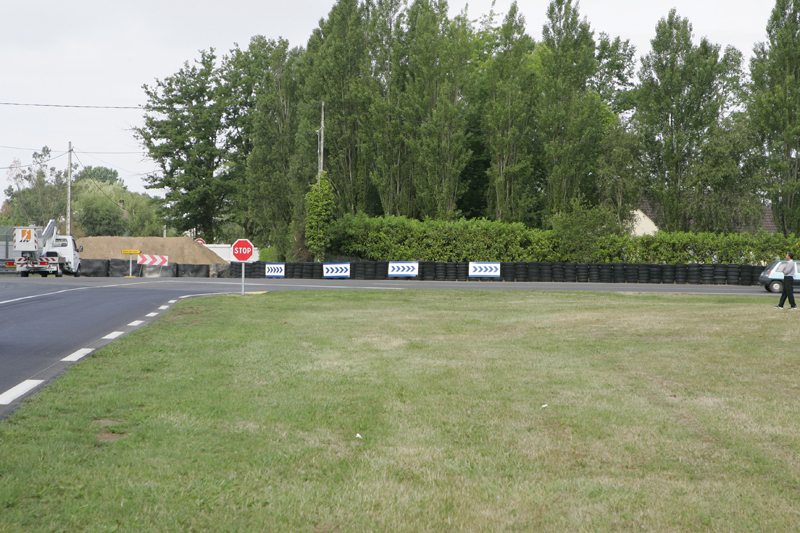 Mulsanne Corner Exit 2006 Spectators are not allowed here any more. 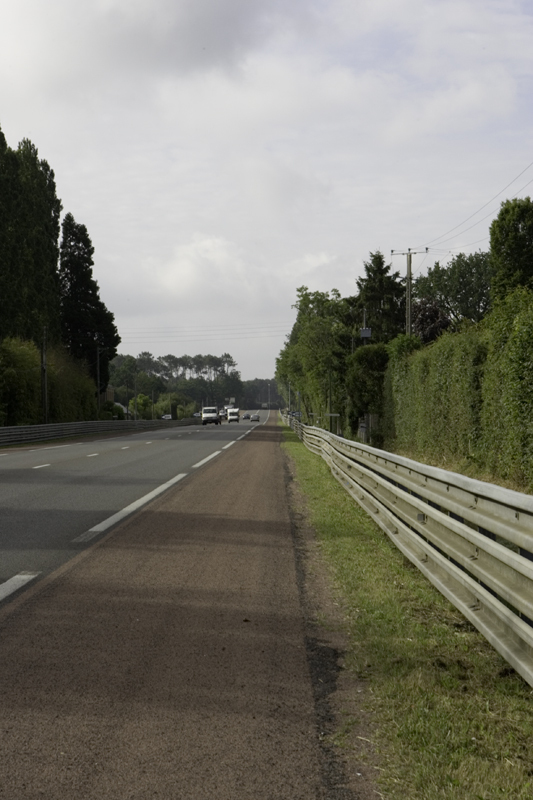 Mulsanne Corner Exit 1970 Probably one of the most famous corners in road racing. 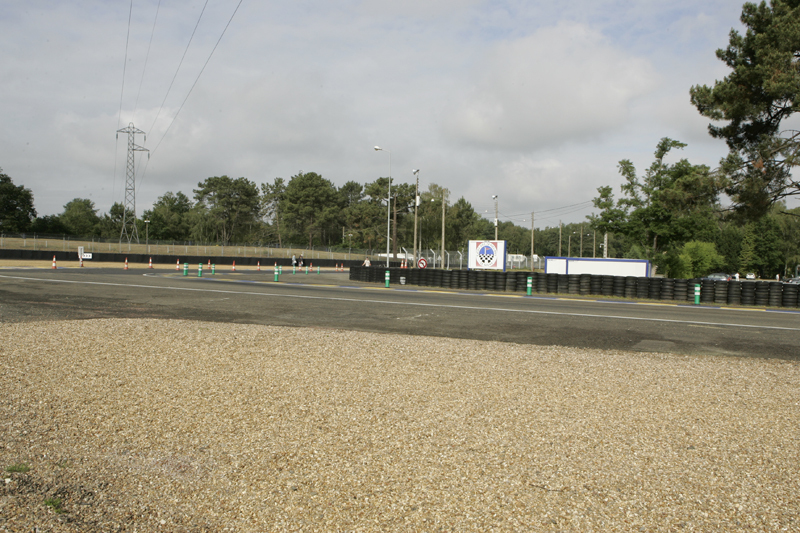 Mulsanne Corner Exit 2006 What used to be a spectator viewring area is now a parking lot. 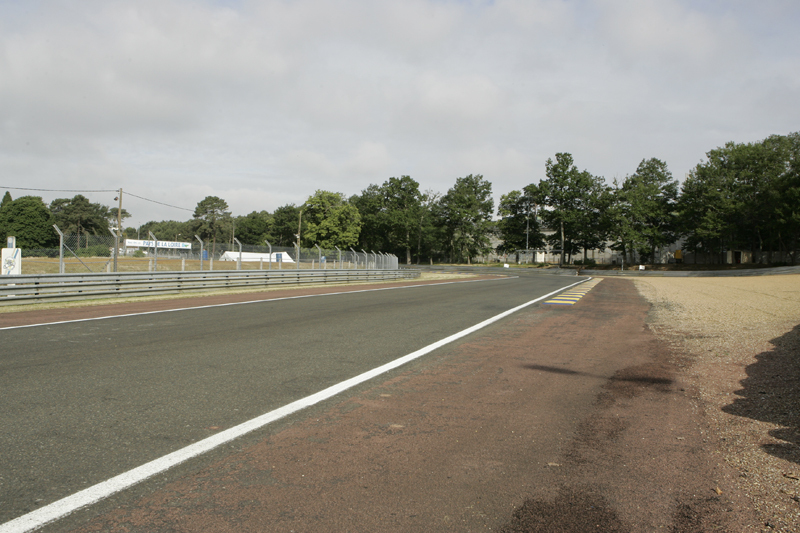 Mulsanne Corner Exit 1970 Spectators could get a lot closer than they can today with no debris fences to obstruct the view and photography. 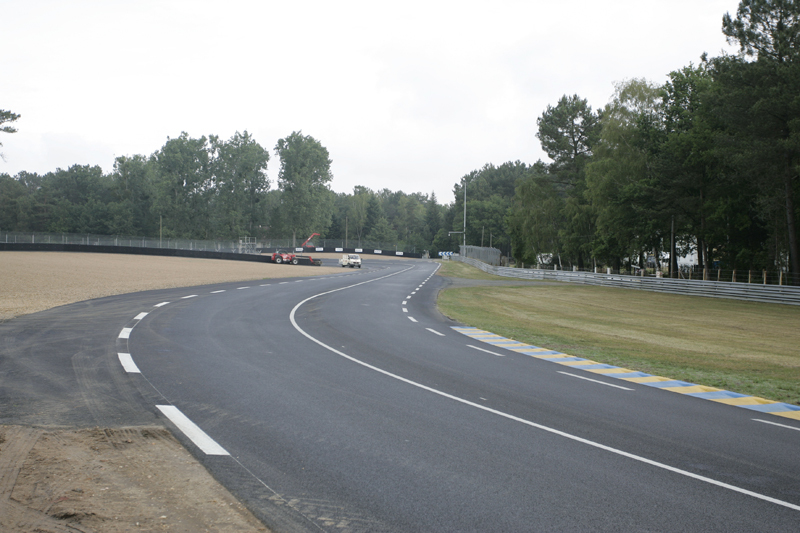 Mulsanne Corner 2005 The corner has been much improved over the years and is now much safer for the drivers. 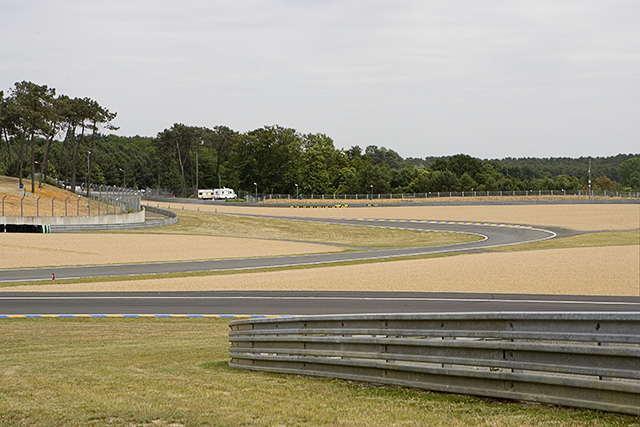 Mulsanne Corner Exit 1970 Spectators could watch from a viewing mound which is no longer there. 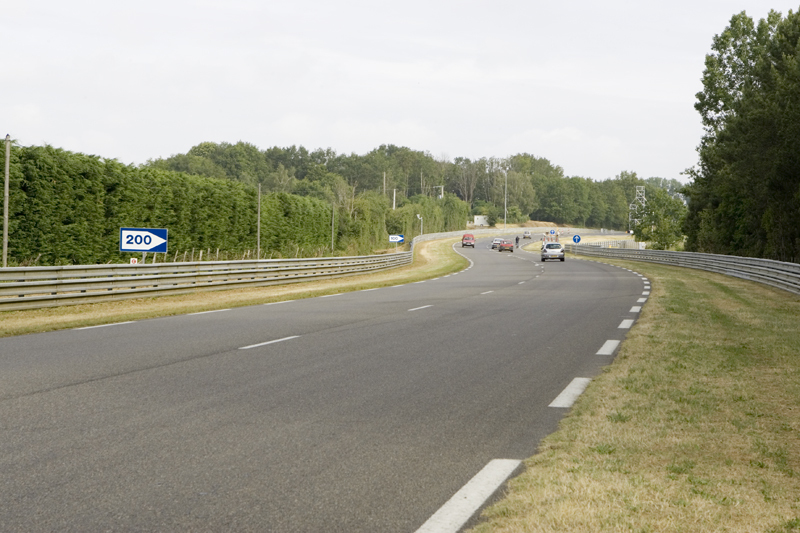 Mulsanne Corner Exit 2005 Called Mulsanne because if you go straight you go to the village of Mulsanne. Clever, huh? 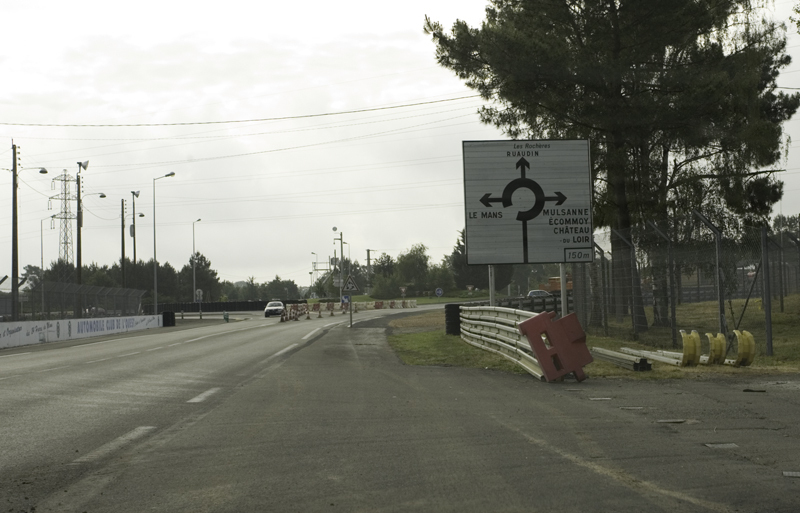 Mulsanne Corner exit 2005 Road sign indicates the traffic circle which is bypassed for the race. Old signaling pits on left. 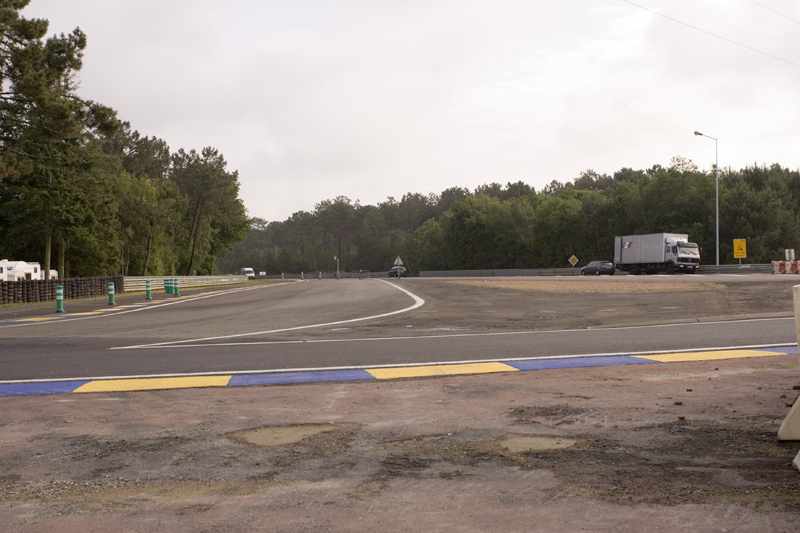 Signaling Pits 1970 Before radios were used in racing, crews would telephone to signalers here who would hold signaling boards out for the drivers. Signaling Pits 2005 The signaling pits are no longer used. Indianapolis Entry 1970 This corner hasn't change much at all since 1970. 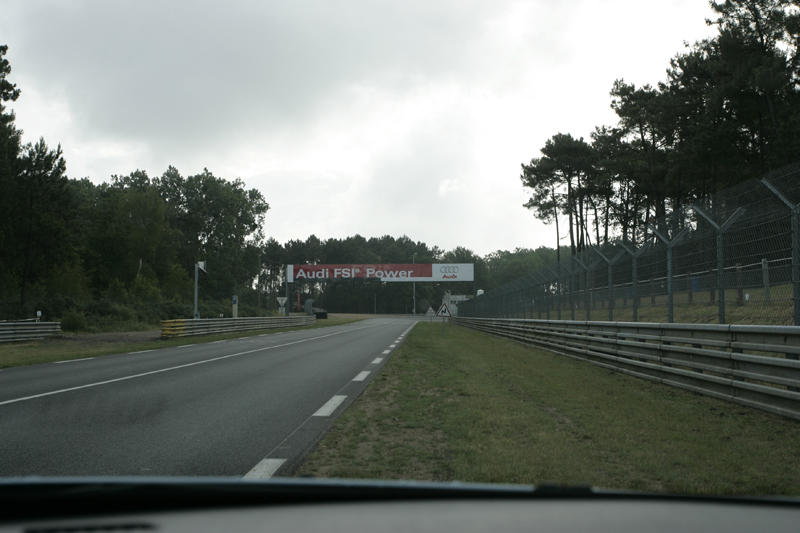 Arnage Exit 2005 Looking toward the Porsche Curve. Maison-Blanche 1970 Literally "White House"
Maison Blanche 2005 The course no longer passes here as it was just too dangerous. 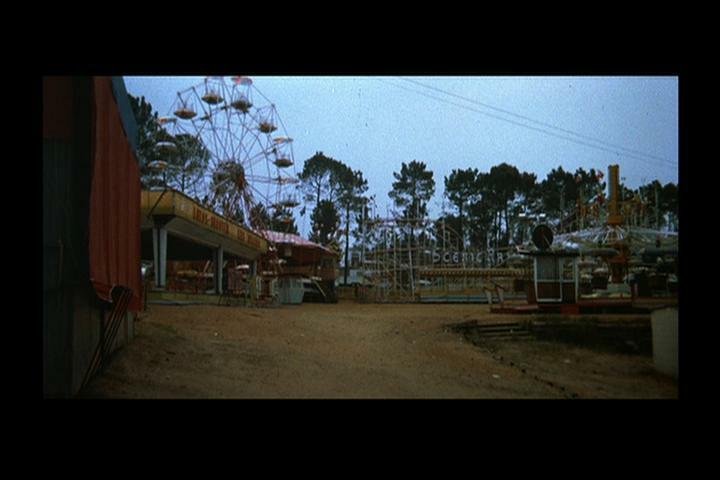 The Ferris Wheel in 1970 A lot smaller then and farther from the track. 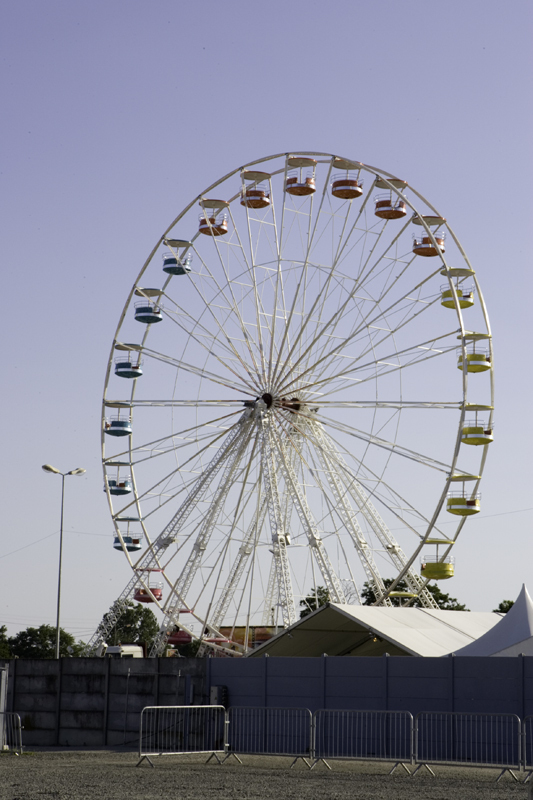 Ferris wheel 2005 Bigger and closer to the race track. 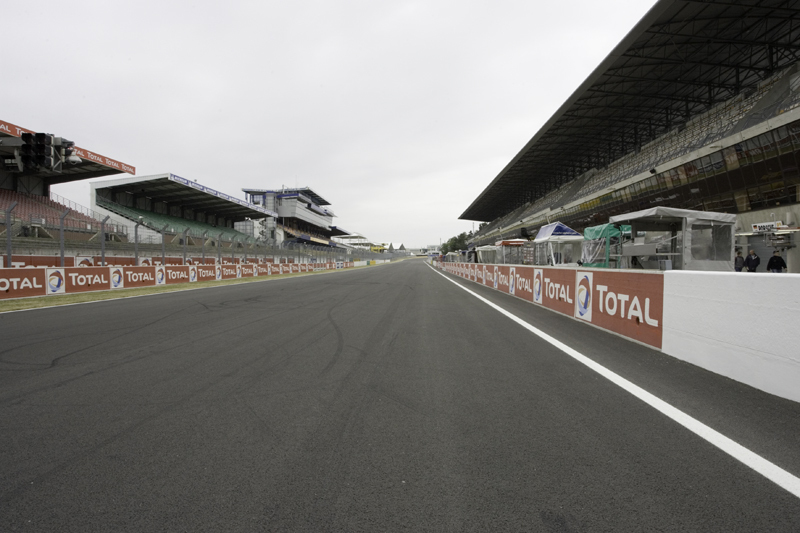 Chicane 1970 Installed to slow the cars on the grandstand straight after the 1955 accident which killed driver Pierre Levegh and 80 spectators. 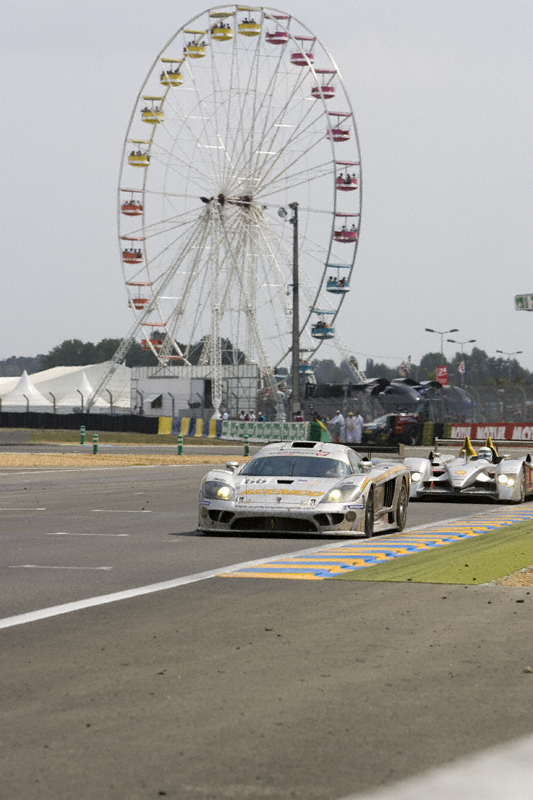 Ford Chicane 2005 is actually two back-to-back chicanes now. 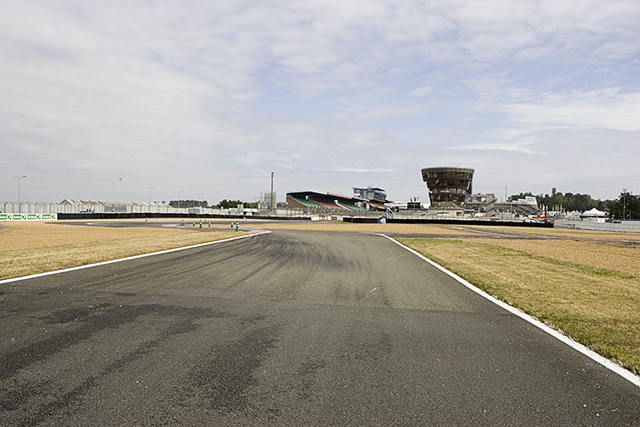 The large building in the right middle background is ACO race control. 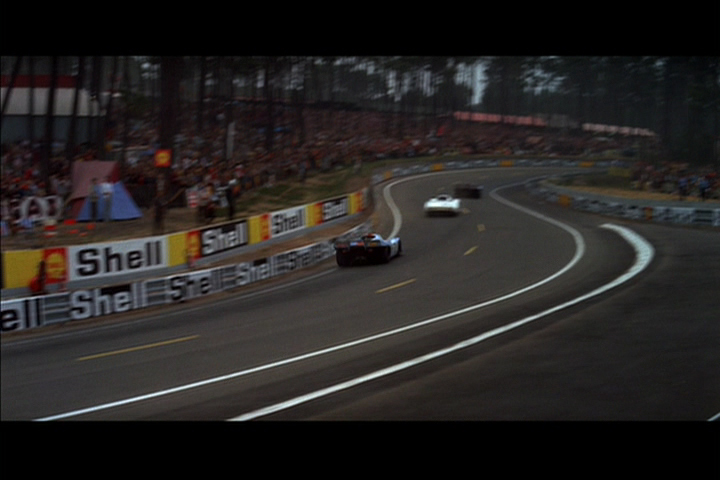 Chicane 1970 Two 90 degree turns connected by a very short straight stretch slowed the cars substantially. 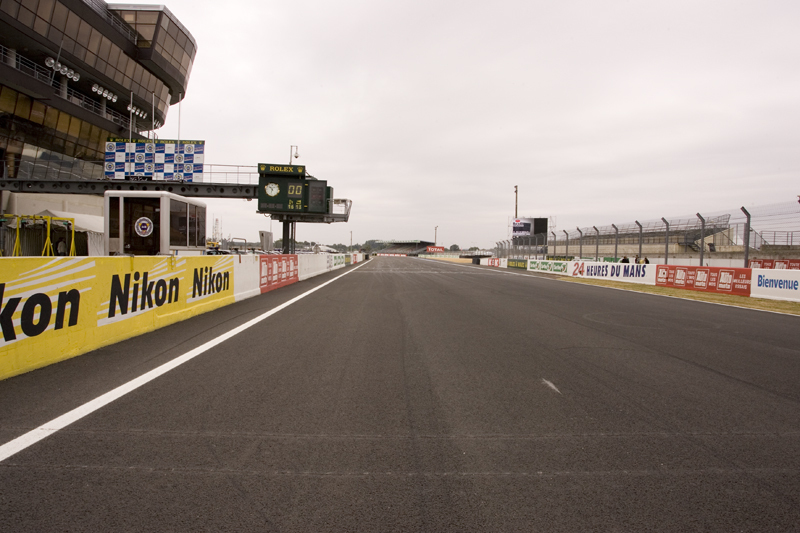 Ford Chicane 2005 This shot shows the Ford Chicane Grandstand as well as the chicane itself. 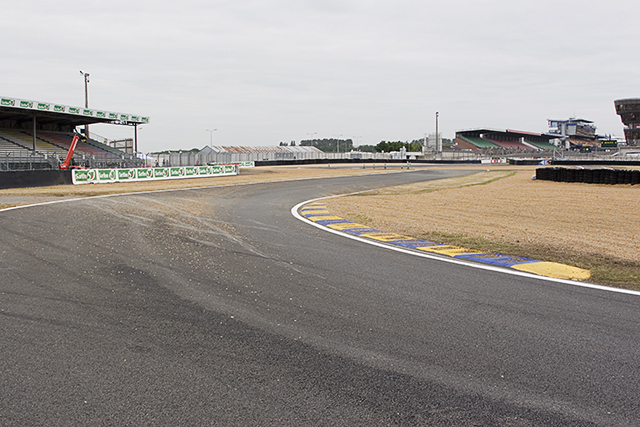 Note the gravel dragged onto the racing surface. 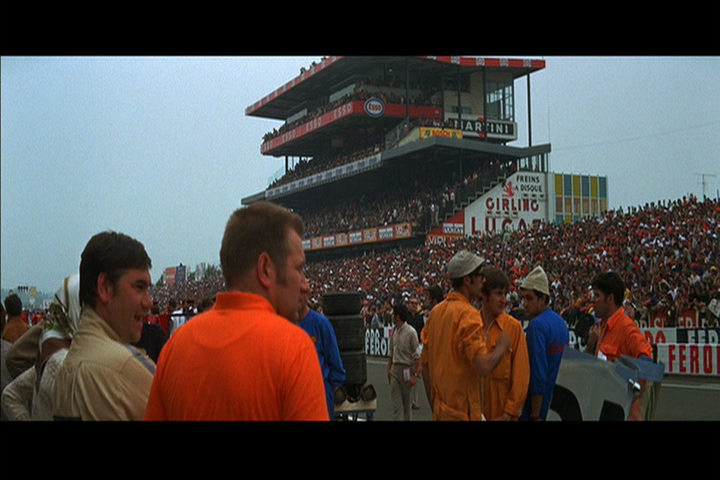 Grandstand Straight 1970 Note that there is no separation between the race track and the pit area and no garages. Grandstand Straight 1970 They had VIP viewing areas even in 1970 over the pit stalls, but they were lower and smaller than today. 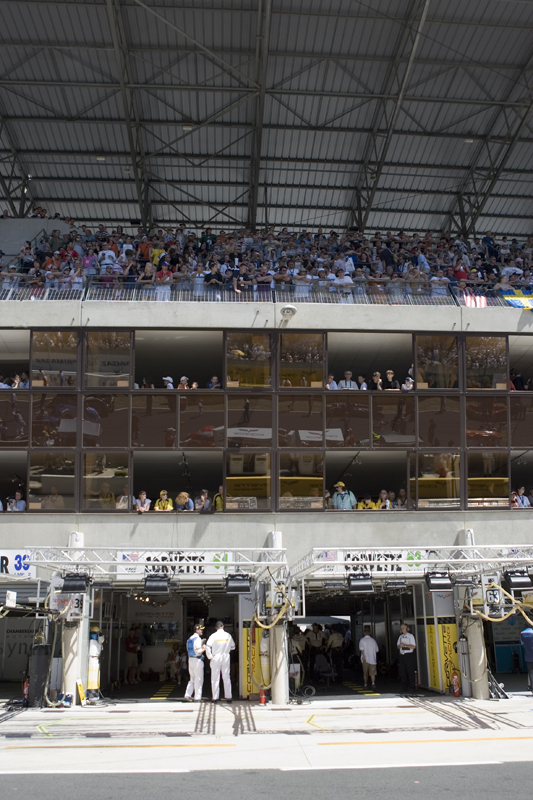 Grandstand Straight 2005 In 2005 the VIPs are housed in air conditioned comfort behind tinted glass with the less fortunate in covered seats above. 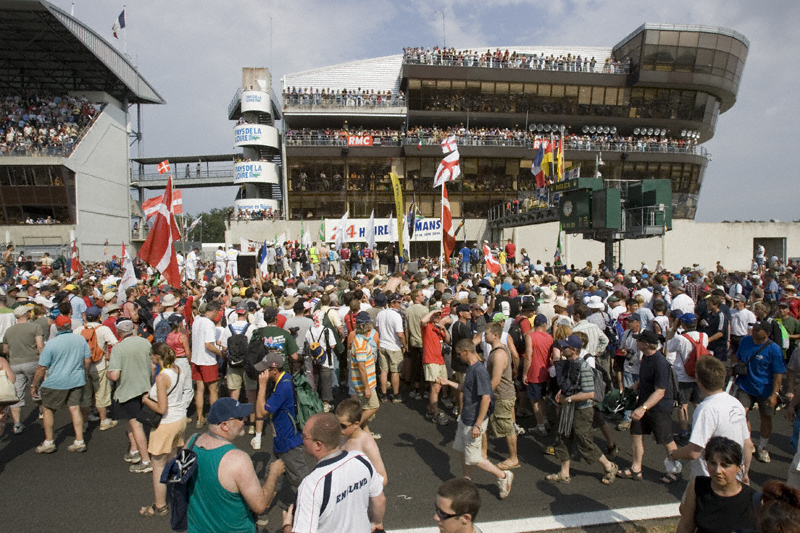 Grandstand Straight 1970 With no separation between the racetrack and the pit area, the people on the right of this frame are very vulnerable. The Hump 1970 The Infamous Hump. 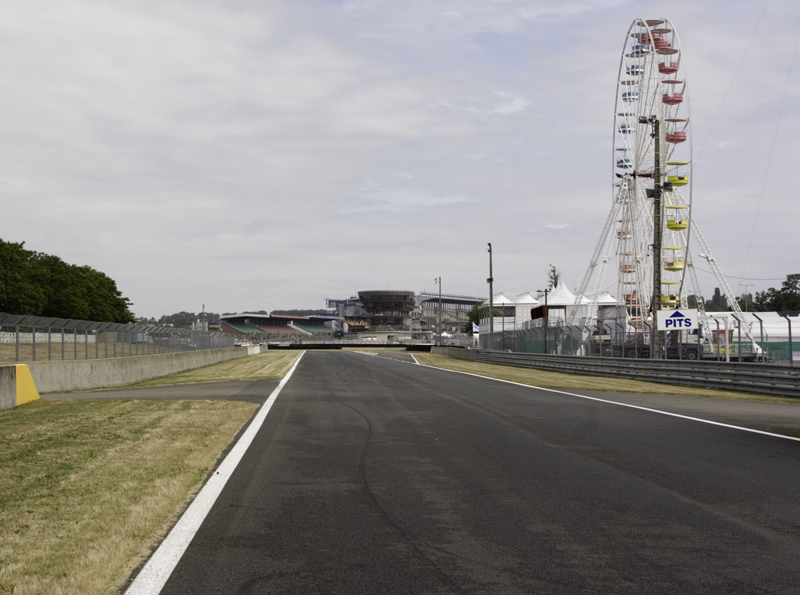 It was completely removed in 1989 after a Mercedes became airborne here. Pit Exit 2005 Note the stop light on the left. 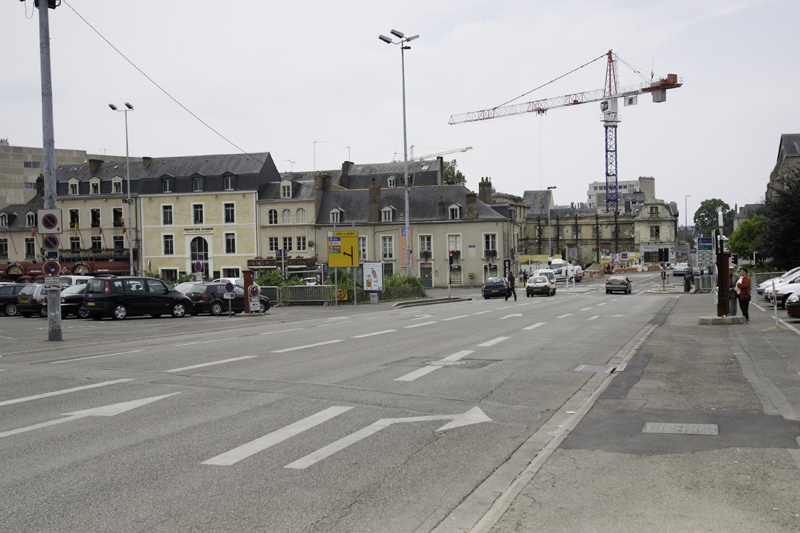 The building in the right middle foreground was demolished in November 2005.